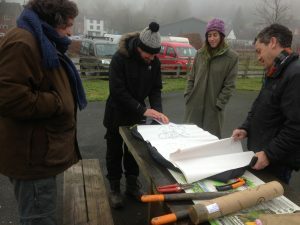 Using maps and designs drawn up by participants on a PDC held in Llanrhaeadr in the Summer of 2017, we worked out where the best place to plant the herb garden would be. Then we went down to the site to map out the herb garden – complete with herb spiral – using pieces of willow and some string. 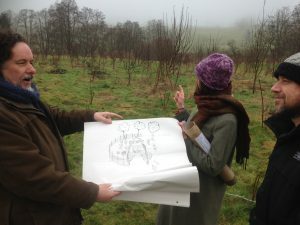 It is going to be a wonderful addition to the food forest, and we look forward to keeping you up to date with developments. Over the coming weeks we are planning several events to get the local community more involved with their Orchard, the first of which will be a Wassail on the 21st January! More details to be announced!